My goal here is to improve the performance of my move generator, which finishes perft (start_pos, 6) in 8.5 secs. That's too slow for C++ code (the same Java code runs in 11 secs). The bottleneck is the check for validity, which in turn tests if the king is in check. This is running for every move, and given that most moves are legal, it's a total waste of time. 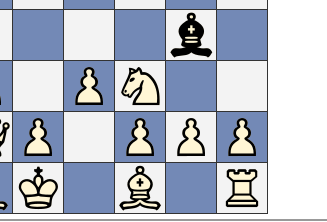 As pointed out by Student T, we should restricted this test for king in check, pinned pieces and en passant captures. a) What is obstructed() doing? 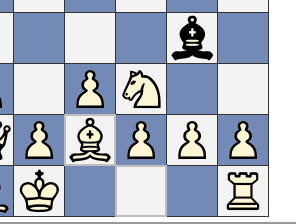 b) After getting the pinned set, how exactly do I use it to test for a valid move? The f3 knight is not pinned because there is something else behind it. obstructed takes this into consideration. B: Once you get the pinned pieces, you can just do XAND to check if the piece you want to move is pinned. If it's pinned, you can't move it. You won't find obstructed() because it's just a pseudocode function. You're expected to implement pinning in obstructed() yourself. // is moving along the ray towards or away from the king. Answering my own question here. I've managed to increase the speed of the move generation code, by implementing the pinnedPices() routine. The rectLookUp matrix stores the pre-generated bitboards representing the squares between two given squares. Everything else will be legal, assuming your pseudo-legal generator is bug-free. You can improve it further for cases 'c' and 'd' (checking only evasive moves for ex). Hope it helps someone, thanks! Not the answer you're looking for? Browse other questions tagged engines programming illegal-move performance pins or ask your own question. Could you show me the code(s) of one or more simple chess program(s) written in C#?